This entry was posted on December 12, 2014 at 5:26 PM	and is filed under Tools & Tips. Tagged: 440, baron, BBQ, broil, broil king, Broil King Baron, caveman, cooking, eating, food, grill, grilling, king, review, Stainless steel. You can follow any responses to this entry through the RSS 2.0 feed. You can leave a response, or trackback from your own site. I give your rating system 5 stars! Hilarious but on point. Great review and I’m craving one of those burgers now. Excellent review. Positive, thoughtful, impressive knowledge of your subject matter. Looking forward to more of your reviews. (Not to mention your culinary skills). Thanks, Leo! More on the way, soon!! I think I really need to have a taste test before I’m convinced….. Try adding a smoker box, Barbara. While I agree that charcoal adds a distinctive flavor, the convenience of gas, together with the flavor enhancement of a smoker box, makes for a worthwhile alternative. Thanks, Jimmy! Wish you did, too!! Great review! 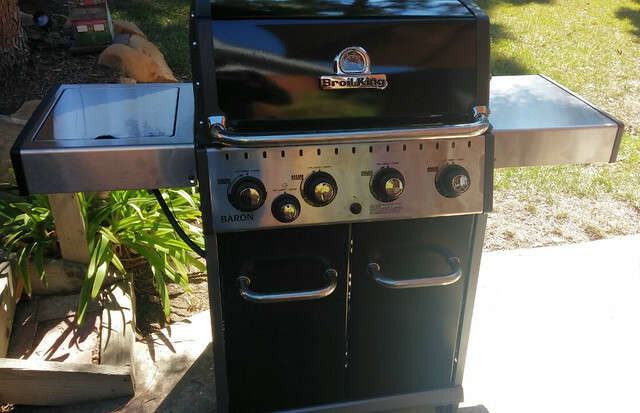 Would you know how much the Broil King Baron 440 Grill is if you get it for its natural gas counterpart? I was thinking if the price difference between the propane and its natural gas grill, then it’d be a better investment to go with a natural gas. Thanks, Phil! From what I can see, the NG version is $50 more ($100 more for NG and SS). Being that my cave is in earthquake territory, I have seen NG supplies (along with electricity and water) cutoff in the past. Hence, the propane 5 gallon tank version comes in very handy when a major tremblor strikes. Thanks for the review! I was pretty convinced that my only options were Weber or crap until this baby caught my eye at Lowe’s yesterday. After reading your review I’m totally sold. Can’t wait! Cool, Todd! Let us know if you like it as much as we do. My Weber Genesis Silver finally crapped out after 10 years of use. It was a decent grill, but flare ups were definitely a problem, and it required close supervision. As I searched for its replacement, I looked at Weber’s of course, but was not impressed with their advancements. That being, the new ones look to be about the same as the one that I bought 10 years ago, other than what appear to be some rather cosmetic changes, and ya’, a hefty price to boot. I also considered the Char-Broil Commercial series. A relative of mine has one, and they do produce great results. However, they do appear to leave a lot to be desired in the durability department. I really didn’t know much about Broil-King grills, but from the Baron on up, I really liked what I saw. Then, there was review after review gave them glowing remarks, for quality, ease/excellent cooking results, AND durability. Imo, it’s like taking the best of Weber, combining it with that of Char-Broil as well, and wallah, a better, durable, more affordable, and versatile grill is born in the Broil-King Baron. I also bought the 440 model, and it is due to be delivered next week. I’m very much looking forward to using it, and appreciate articles like yours, that confirm my decision to go with this beauty of a hybrid, and made in North America ta’ boot. Who says that Canadian and Americans can’t make quality products at a reasonable price?! Bam!, this one looks to have “Got er’ done!”, NICE!!! Sounds like you did your homework, John. Can’t wait to hear how you like it once you’ve taken it for a spin. Does having a fire box mean that this grill is gas/smoker combo. We have a charcoal grill, but sometimes I would like a nice steak on a gas grill, however, my husband is into smoking lately. Does Broil King make a combo like this, a gas grill with an offset fire box for smoking? JB, the firebox is the heavy cast-iron lower chamber that houses the burner assembly, the Flav-R-Wave™ grids, and topped by the cooking grates. This grill is not a grill/smoker combo. Though, I did add a small cast-iron smoker box that adds some nice smoke flavor while grilling. Hi Cave – thanks for the review. I’m inches from pulling the trigger on this unit ( in NG config) and I’m wondering if you have had any issues pop up since your purchase? Some reviewers complain about the doors being difficult and one dude even melted off the knobs. Anything happen that would cause you to downgrade your 5 club rating? Zman, I still love this grill. No issues on my end … and, I’m wondering how the heck he melted off the knobs! On a side note, I’m anxiously awaiting their new line of smokers which should be out soon. Excellent! I’m sold. Bought it and Lowes will deliver tomorrow. I’m thinking tongue tacos on the 4th. Thanks again for the review and quick reply. My pleasure, Zman. We’d really like to hear your thoughts after you’ve broken it in! Hey Cave – it’s March of 2016 now and I’ve had all summer and winter to use my grill. We really like it and it’s done a great job cooking everything i’ve asked it to cook. 1. The bun rack sits rather loosely in its frame and can be tough to get back in place if it’s really hot and you just brushed it off – it can get knocked out of position a little easier than it should. I have a DIY catch plan that i need to try out this summer. 2. Drip pan – it’s small. I did a double beer can chicken in there and they overflowed the little pan that is in there – chicken fat all over the interior (not clutch) Birds were tasty but the little pan is a bit shrimpy IMO. all in all, i’m very glad I have the grill, it’s a beauty, and the side burner is great for boiling water, making a sauce, and here’s the kicker – i use it to light my charcoal chimney when i’m setting up my smoker – now THAT’S clutch! Zman, so glad to hear you are enjoying your grill. It’s been over a year for me, and I still love it. Personally, I never have had the warming rack slip out on me. Though, I can see how that might happen. I would definitely be interested to hear about your DIY-MacGyver idea. As for the beer can chicken, when I make them, I put a shallow 9×12 disposable aluminum pan beneath them. I place it under the cast iron cooking grids, resting on top of the stainless steel Flav-R-Wave grids. Since the burners under it are off while indirect-cooking the chicken, the thin aluminum won’t burn through, and it catches all those juices that run off. I also think it helps to keep the birds juicy, as the liquids evaporate during the cooking process. Best of all, clean up is easy. BTW, I love your innovative use of the side burner! Bob, they recommend that you season them. It’s very quick and easy, too. Plus, I believe that is what is keeping my grates still looking like they are brand new. It is only the warming crates that are porcelain enamel, the cooking crates are cast iron. I have just ordered this barbecue, researched and researched, so looking forward to using it. Yes read really great reviews. Loved yours Caveman, good job. Thanks, Jean! Good catch, btw. Yes, you are correct that the porcelain enamel warming racks do not need seasoning. But, I highly recommend that you season the cast iron grill grates. Good luck with your new grill. Please, come back and tell us how you like it. Well you convinced me. A picked up my Baron 3 months ago. My experience was less than favorable. Yes the grill looks good and for the most part the parts all feel strong and stable, however, this grill flares up like crazy. The casting is too shallow and the surface is quite uneven. I literally am cleaning the Flavorizer bars- flame tamers every other use and I am just cooking for two people. Wow, Melissa! Your having a totally different experience than I am. My suggestion is that you call their customer service department. They are very helpful and are committed to a great customer experience. They, most likely, can help you. Though, I must say, any grill can have flare-ups. I have found that the Baron 440 controls most of them when they do happen (mostly on fatty meats at high temps). In the meantime, let me ask, what are you cooking? And, how high a temp are you cooking it at? Damon, all I can say is that, 20 months later, I still love it. I’m out there grilling on it 3-4 times a week, on average … and, it still runs like a champ. When it gets hot out, and we don’t want to turn on the oven or stove, I’m cooking complete dinners on that puppy. No signs of rust or deterioration. What else do you want? Hope you get the same joy out of yours. Let us know how it goes. I just purchased this from Lowe’s yesterday to be delivered today. We’ll probably throw a couple of steaks on this evening. I’ll let you know my impressions later on. I’m curious on how you cook a beer can chicken. Hey, Dave! Hope the steaks went well … errrrr … actually, medium rare!! As for the Beer Can Chicken, you should check out my Juicy Beer Can Chicken recipe. Feel free to substitute any rub you’d like. Lately, I’ve been partial to World Spice Merchants “BBQ Fin & Feather Rub”. You can put the “canned” chicken directly on the grill, or you can use a stand. There’s an inexpensive one made by Camp Chef, or one with all the bells and whistles from Broil King. The ribeyes came out great. Then some brats …..great (but it’s pretty hard to screw up steaks and brats). Then we did chicken thighs. Came out good but I didn’t have the temp high enough. I used to do these on a Webber charcoal kettle and they were fantastic. I ordered the broil king beer can rig and will give a whirl Sunday using your recipe. Maybe I missed it what is the hood temp when you cook this? I believe the hood temp is in the recipe instructions. But, I try to keep it just around 275°-300°. Thanks, Jim. I’ve had my 440 for over two years and see no signs of rust, to this point. Granted, I keep it covered when not in use, and live in So Cal which has been pretty dry until this Winter. But, so far, so good. So sorry to hear about your experience, Wayne. Though, I must say, it is the exact opposite of what I have experienced with the Baron 440. I am more than two and a half years into this grill and have had none of the issues you have had with the burners or the grates. Hi Caveman – looking for a new BBQ – how are you making out with yours now?? Hi Patti! Still loving my BK Baron 440. Just grilled up some chicken thighs 2 nights ago. It continues to work like a champ and I still highly recommend it.